Recently, I’ve joined a small project at my place of work that is considering our online instructional goals and our ability to meet them. The project isn’t large or groundbreaking: it’s an inward-looking analysis of our library’s use of online learning projects and the manner in which they meet the needs of our users, and it’s the sort of analysis that many of us have taken part in over the years. And while the project could more appropriately be considered a “task force” since we’re only a small group and our considerations (I hesitate to call them recommendations) will be written to stimulate debate instead of making transformational change, we’re still taking on the task knowing that our efforts today might facilitate new decisions and perspectives tomorrow. At issue for me are three things in general: the nature of online instruction, our recent goals in this area, and governance. Our readings and discussion have helped us realize that for too long now, tech-savvy librarians (at libraries in the developed world, generally) have focused too much on the development of online instructional tools at the expense of figuring out how these tools can best work alongside “regular” instructional programming. And perhaps more important, we don’t give enough thought to where online instruction sits within our internal governance structures. In short, for the most part, we’ve built our own online instruction silo. In the mean time, I’m putting forward 3 contentions about online instruction in academic libraries. They aren’t profound, but they are assertions, nonetheless. Answer them in response to this post or on your own blogs, Facebook, Twitter, and Plus streams. Let’s get a discussion going. 1. There is no Online Instruction. There is only Instruction. Online instruction’s tools, aims and media differ drastically from “traditional” instructional methods, but it is instruction nonetheless, and it should be afforded as much importance as all other kinds. It is fair to consider the differences between online instruction and classroom one-shots or integrated term-long coursework, but the time came long ago to normalize it and make it an equal partner in our information literacy programmes. No more adjectives and qualifiers: online instruction is instruction, plain and simple. It can’t only be a special project that is taken on by our adventurous colleagues or offered to our interns and junior librarians to explore. Instead, we must find efficient ways to reduce its learning curve, help train our colleauges, and make it a core part of our IL programming. 2. There can only one instructional group or committee. This group develops instructional programmes and policies at the library, whether they are online or in print, in the classroom or in a virtual chat room. Let there be task forces devoted to online or classroom initiatives, but keep them part of the same governance structure. Let’s keep our focus on the means we have at our disposal to improve information literacy levels and critical thinking skills on campus by fully integrating online instruction into our existing instructional framework. 3. There must be an online instruction coordinator. I may have just declared an end to adjectives and qualifiers in Contention No. 1, but on this point, I stand firm: an online instruction coordinator is needed in order for libraries stay ahead of the technological curve. So much about online work requires specific, technical knowledge and skill sets. Each library should have a coordinator who manages instructional content on the website, promotes web-based instructional tools, liases with university online learning services, and leads training programmes for new technology-based instructional tools. Let this person sit on instructional committees and web committees, and let this person work in concert with the web publisher to seamlessly integrate instructional content with the website’s directional and informational content. Above all else, online instruction can no longer be the purview of only a few individuals in academic libraries. I speak these words to like-minded librarians who are already tech-savvy and willing to try new projects and ideas: it’s time that we shift our focus from integrating online instructional tools into our individual practice to blending them into the library ethos. We can do this by concentrating not on programmes and apps but on the people we work with and the people we serve. We must find the means to make online instruction accessible not only to our users, but to our fellow librarians and content producers. What is a technological challenge must have a people-driven solution. There is a serious challenge facing the delivery of education in today’s technologically dominated media social landscape – our university leadership and faculty members have not been generally trained to speak, let alone be fluent in the languages of images and digital media. The “teachers” and university leaders are fluent in text-based languages, not the image and digital literacies that are the dominant channels of information and communication today . . . In the years to come images and digital media will continue to expand – how do we prepare our current students become fluent in the ways that will allow them to contribute to advance social well being? How do we teach our learners to be visually and digitally literate? Where are we giving them these skills? As “teachers” how do we attain these new literacies? How do we communicate effectively with students who have are familiar with different modes of communication? How do we teach critical thinking and research skills to students whose alphabets, vocabularies, and languages are visual more than they are textual? What fundamental changes have occurred to research (and to teaching research) with the shift to the digital and the visual? How do we keep up with these new technologies and literacies, ourselves? So head to Tim’s blog: read, and discuss. You may also want to check out my previous post on transliteracies, which may have some useful links on the matter, too. Edit: Jan 31/2011 – Check out the link that Val Forrestal provides to her blog in the first reply to this post. Last summer, she and a colleague filmed their attempt to read e-books on an ipad by way of different vendors.. It’s worth checking out. -michael. Regular readers to this blog will know I’m a big fan of the iPad as an instructional tool and expect it to become a common piece of technology on our campuses in a few years. As more competitors enter the market, as more and more apps as built, and once Apple starts offering educational discounts on the iPad(as they did with the original iPod Touch when it purchased with a MacBook or an iMac), tablets of all sizes will become a ubiquitous learning tool. That’s not to say that the iPad is Steve Jobs‘ gift to education; tablets are not a perfect learning tool by any means. An iPad is a great reading device, and it’s a great social and communicative device, but it’s not great at synthesis: we’ll still have to turn to a technology with a traditional keyboard to write our papers. But that shouldn’t hinder the tablet’s growth. After all, the book is an incredible reading device but it’s not a great writing tool. But it’s still made it this far. What will hinder the growth of iPads on campuses, though, are our e-book platforms. It goes without saying that e-books have altered the publishing industry, in both consumer and scholarly circles. I know my colleagues at our health sciences library, for instance, love the speed in which medical e-books are being published and revised – and they’re looking forward to seeing more of these full-color books in the hands of their medical students by way of the tablet. But if ever there was a roadblock to this growth of e-books and tablets, it’s got to be the vendors’ browser-based e-book interface. While very few people actually prefer to read an e-book front to back with their 21″ flatscreen monitor, even fewer people want to read the same e-book on a 9″ tablet through the same browser interface that was designed for nearly two feet of high-definition viewing. The shoddy form factor ruins the reading experience. These three images show how annoying it is to read a MyiLibrary book on an iPad. Although a reader may appreciate the table of contents on the left, the contents of the book (i.e. that which really matters to the reader) are hard to flip through because of the lost real estate on the screen. Furthermore, pages must be turned by using very small arrow icons at the bottom of the page, and the full-screen mode (seen in the third image) takes up only 2/3s of the screen at best. 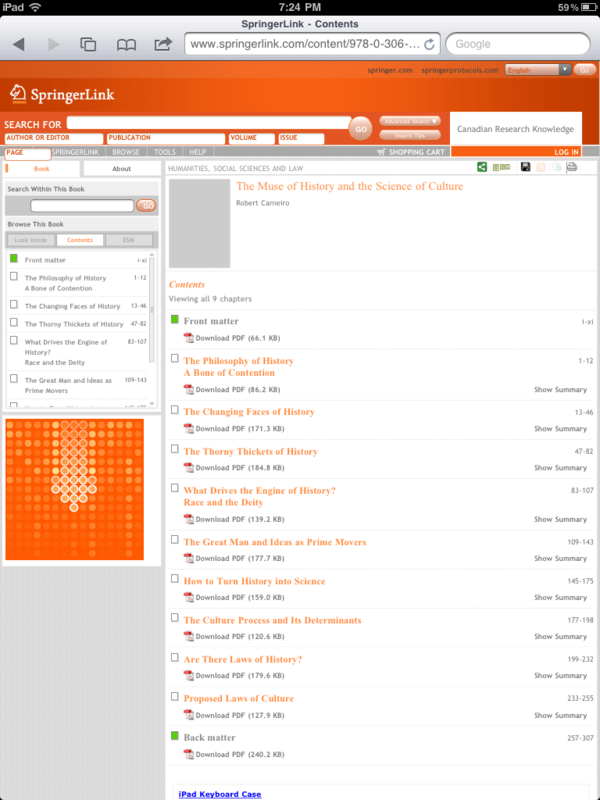 This browser interface may protect MyiLibrary’s content, but it does so at the reader’s expense. Considering a text housed on SpringerLink. 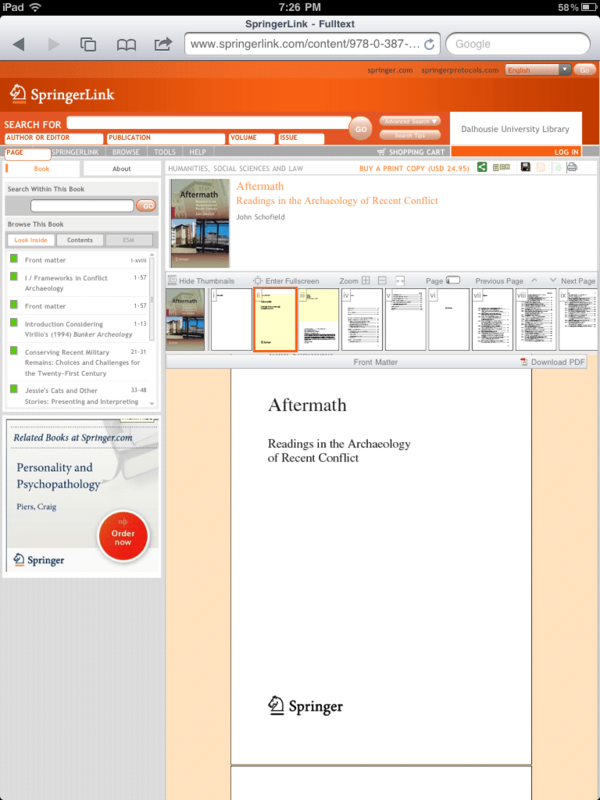 Chapters are offered as full-text PDF downloads. Springer clearly treats this book as a journal with separate articles. 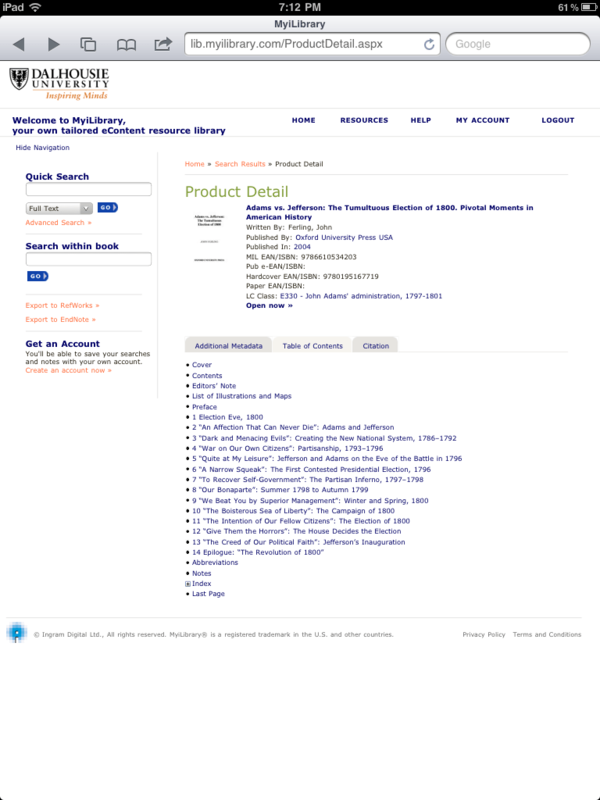 The first page in the SpringerLink interface. Users can browse the text with the horizontal bar before zooming in on a page below. 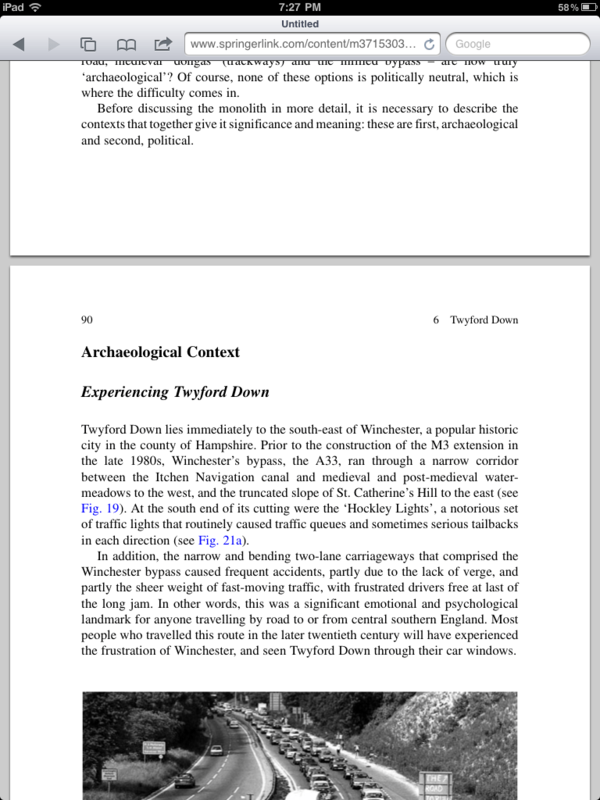 Reading SpringerLink PDFs on an iPad is a beautiful thing since full-text PDFs can be downloaded through the browser. You can see by my comments that I prefer the SpringerLink interface. There are, of course, other scholarly e-book platforms other than SpringerLink. And of course, SpringerLink’s reading experience isn’t perfect, either (e.g., opening the text was difficult on an iPad, but after that it was smooth sailing). However, my point in taking these screen captures was not to railroad one vendor in favor of another. Rather, it was to highlight something that is vital to tablet use on campus: vendor platforms that make reading accessible with this technology. Librarians, scholars, and students are going to be stuck with poor interfaces until the vendors find a way to transfer their intellectual property through a browser with ease. Maybe each vendor will develop an app that works with a library’s proxy to circumvent this issue, but then the libraries have got to deal with unhappy patrons who themselves must deal with a half-dozen programs to open as opposed to their one Safari or browser window. It’s times like this that I wish instructional librarians truly worked closer with systems librarians as well as with vendors. The iPad is an opportunity for all stakeholders on campus, but we’re going to be spinning our wheels for some time until we can find some common ground regarding content delivery on the device.